Marker has been removed from the site. 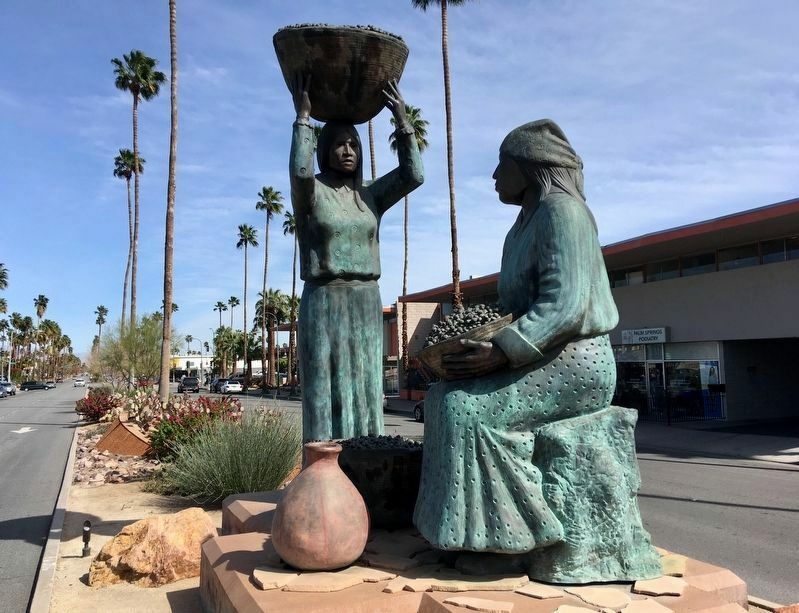 The warm spring here was the site of Se-Khe (Boiling Water), important village of the Kawasic Cahuilla Indians. The Spanish called it Agua Caliente (Hot Water). A stage station of that name operated from 1862 to 1876. As early as 1871 the Indians operated a bath house for tourists and the site tribally owned. 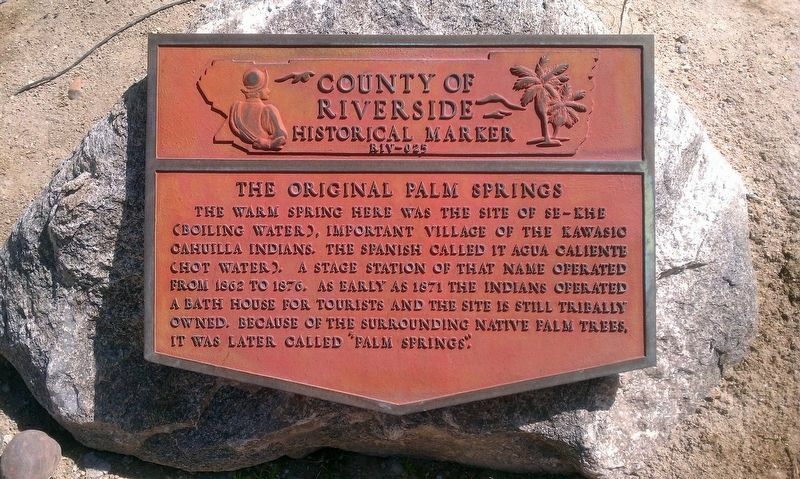 Because of the surrounding native palm trees, it was later called "Palm Springs". Location. Marker has been permanently removed. It was located near 33° 49.403′ N, 116° 32.724′ W. Marker was in Palm Springs, California, in Riverside County. Marker could be reached from the intersection of Tahquitz Canyon Way and Indian Canyon Drive. Touch for map. Marker was in this post office area: Palm Springs CA 92262, United States of America. Touch for directions. missing. ); Oasis Hotel (about 500 feet away); Lykken’s Department Store (about 600 feet away); Site of First Community Church (about 600 feet away); McCallum House (approx. 0.2 miles away); The Cork'n Bottle Building (approx. 0.3 miles away). Touch for a list and map of all markers in Palm Springs. Regarding The Original Palm Springs. 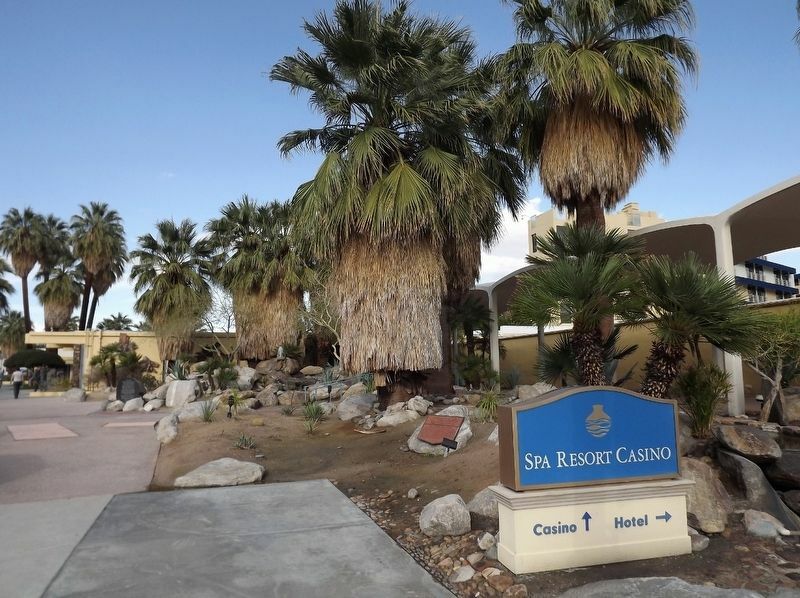 In the summer of 2014, the Agua Caliente Tribe made the announcement that they planned to demolish the spa casino that existed at this site for many years. In June of 2015, the spa casino was demolished to the disappointed of many locals who had hoped the Tribe would have at least preserved a few architectural elements of the building complex. 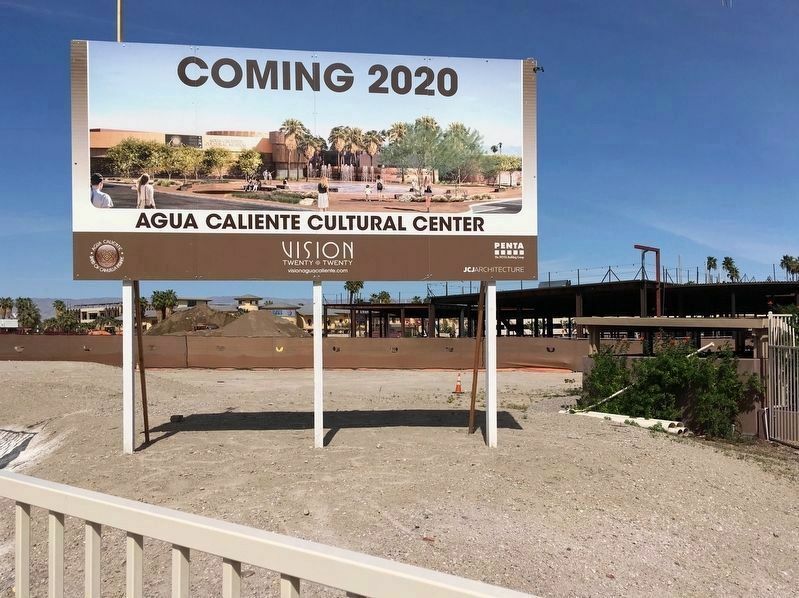 The Aqua Caliente Tribe will not disclose what their plans are to do with the property so it currently sits fenced off and an empty lot. Marker has been removed from the site. View of spa casino prior to demolition. 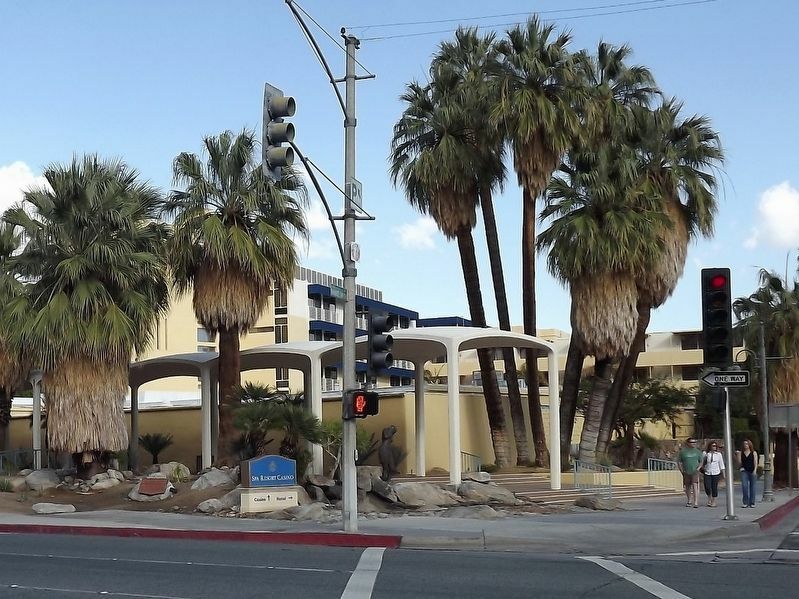 least appreciate and learn a little history of Palm Springs. My assumption is the Riverside County Historical Society has relocated the historical markers to their headquarters until they can hopefully be replaced sometime in the future. Bronze, 1994, by Doug Hyde. Located in the center median of Tahquitz Canyon Way at Indian Canyon Drive. More. Search the internet for The Original Palm Springs. Credits. This page was last revised on April 1, 2019. This page originally submitted on January 20, 2018, by Douglass Halvorsen of Klamath Falls, Oregon. This page has been viewed 75 times since then and 25 times this year. Last updated on March 30, 2019, by Craig Baker of Sylmar, California. Photos: 1, 2, 3. submitted on January 20, 2018, by Douglass Halvorsen of Klamath Falls, Oregon. 4, 5. submitted on March 30, 2019, by Craig Baker of Sylmar, California. • Syd Whittle was the editor who published this page.